Payment is made at the time you place your order online unless you have made previous payment arrangements. Orders go into the Maker's schedule in the order they are received. Payment in full is required before leather is cut. We accept PayPal, Credit/Debit and Check/Money Order payments during our secure web checkout. Please call and place your order directly with us if you need payment arrangements, we are able to help. We guarantee your 100% Satisfaction. It is important to check your order specifications as we build each outfit personalized to your order information and covered under our guarantee. If for any reason you are not completely satisfied please call us immediately upon receiving your order. 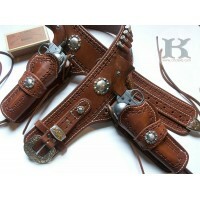 In the years ahead, if you should lose or gain weight and need your belt resized we can do it. We just ask for return shipping. 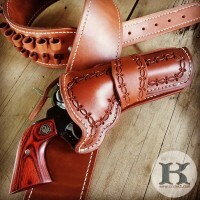 All Circle KB holsters are custom hand made to order by Maker Brett Park exclusively at Circle KB.